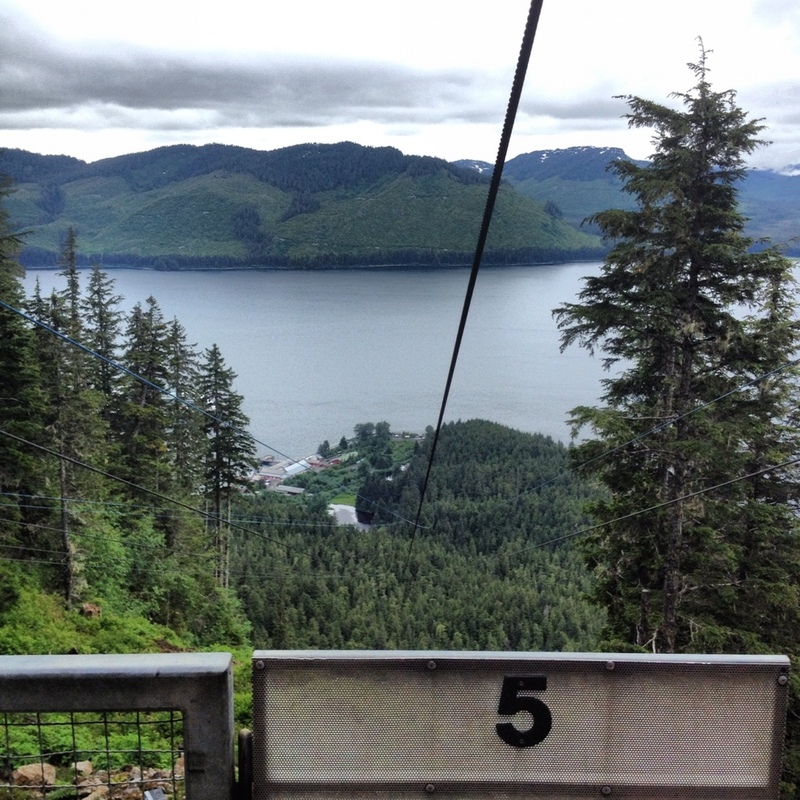 Today’s port of call, Icy Strait Point, could not have been more different than Juneau and Skagway. In those towns, disembarking cruisers are greeted by a gauntlet of t-shirt and jewelry shops. (Can someone explain to me the connection between cruising and buying diamonds? ‘Cause I don’t get it.) By contrast, Icy Strait Point is owned by a tribal corporation and doesn’t partner with outside retailers. Instead, the entire focus is on experiencing nature on (and off) the island – whale watching and/or bear-sighting tours, ATV rides, hikes, nature rides, and the option we chose: ziplining. Now, those of you who know me outside the pixel world know that I am terrified of heights, so riding a zipline doesn’t seem like the most obvious choice for me, but JoAnn and Nick really wanted to do it, having enjoyed it on their trip to Hawai’i. Based on their experience (short runs, not that high, etc.) they convinced me it wouldn’t be that scary. Well. We were all wholly unprepared for what was, in fact, the world’s longest zipline: 5,330 feet and a 1,350 foot vertical drop at 60 MPH. So high and so fast Nick couldn’t go, because he’s had back surgery and it’s not recommended for anyone with back trouble (and a host of other medical situations). JoAnn and I decided to persevere – even though we both realized this was not going to be a leisurely sightseeing-type experience. Our bus load of zipliners further convinced me that there was no way I could back out – there were two women in their mid-70s (who had rappelled down a cliff the day before!) as well as two sisters aged 10 and 11 (who were with their parents and had been told, “You are doing this, and you will like it!” *) And seriously, when there are grannies and children doing something scary, well, bagging out would have been too humiliating. In our group, I was in position number five – we went in order of size, and only the father of the two little girls was taller than me. I can honestly say I have never been so scared in my life as when I was strapped into the harness (which was a little canvas seat with straps and buckles here, there, and everywhere) with my feet on the door waiting for it to open. “Why am I doing this?” was running through my head. I’m pretty sure I said it aloud to the kid strapping me in at least a couple of times, too. 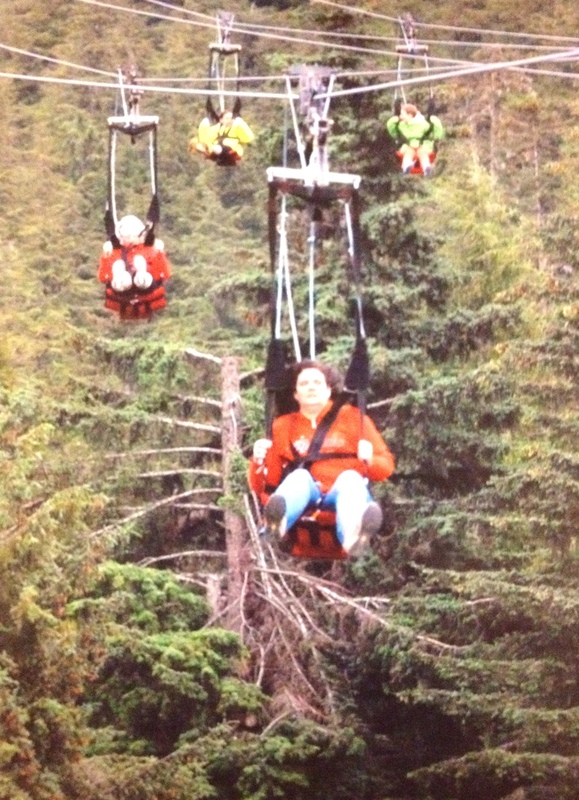 The picture above of my fear-face (a bad phone scan of the print sold to me afterward) does not even begin to show how absolutely terrifying the ride down was. I had my camera in my hand (tethered to my wrist) but could not – could. not. – make my hand let go of the strap for long enough to take a picture. I’ll concede that it was a pretty amazing view, but I’m not convinced it was worth scaring myself half to death over. I don’t think I breathed the whole way down, and when I got to the end (where the springs snapping together sounds like a tazer) I needed help getting out of the seat, and immediately began hyperventilating and crying. Like, a lot. So much that Nick, who had been waiting at the bottom with our bags, had to give me the biggest, longest bear hug to calm me down. I was a wreck. But I did it, and now I know for sure that I have no need to ever, ever drop a thousand-plus feet off a mountain again. Ever. * Lest that quote make it sound like the parents were meanies, nothing could be farther from the truth. 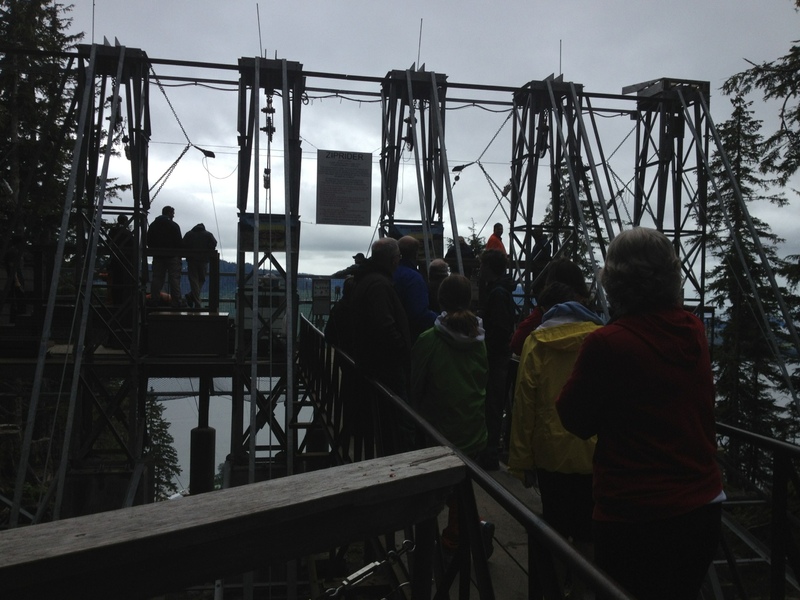 They were lovely people – but ones who clearly had to overcome a little tween resistance to the idea of ziplining. We’re glad you DID IT! Remember when your parents would ask, “would you jump off a bridge (or in this case, mountain) if somebody told you to?” Well Sarah, now we know! You are sooooo waaaaaay cooler than I am. No way, no how could you get me to do that. I’m glad you did and you’re description is awesome. Hope today is less terrifying. Consider it a character-building experience 🙂 Where was Mom? While it sounds like your experience, Sarah, was waaaaay outside your comfort zone, it sounds like something that’s totally within mine. 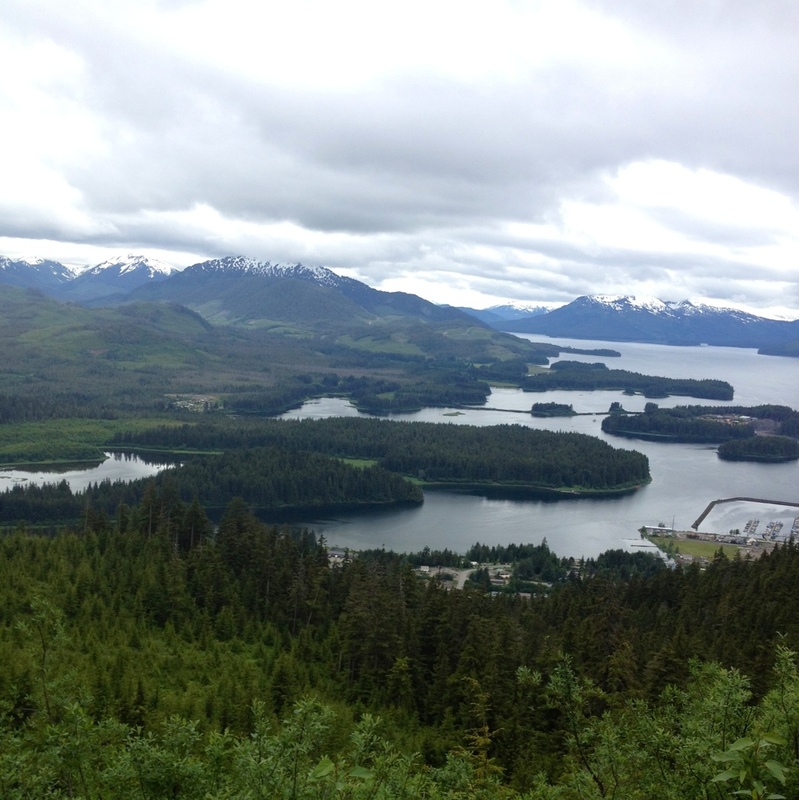 Plus, you snapped pics of snow-capped mountains – how can I not enjoy that? Sarah, I am in awe of your guts. That is def NOT on my bucket list. Me and your uncles are enjoying your journal/blog immensely. Mom actually opted to take a day of rest, so she was back at the boat napping and missed the whole thing!